After nearly fifty years in suspended animation a crew of human space explorers return to Earth, only to discover a medical side effect that prevents them remaining on their home planet. Now, in a desperate bid for survival, they must return to space and attempt to colonize an alien world under an alien sun. J. Brian Clarke is best known for sixteen stories published by ANALOG magazine ... five were ‘cover’ stories ... and ‘Dinoshift’ was nominated for the Science Fiction and Fantasy Writers of America (SFWA) Nebula award. Clarke’s stories have also appeared in GALAXY, EXPANSE and ON-SPEC. ‘Earthgate’ was the lead in Donald A. Wollheim’s 1986 ANNUAL WORLD’S BEST SF. ‘Testament of Geoffrey’ appeared in the Russian publication INVENTOR AND INNOVATOR. 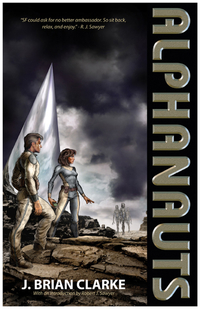 J. Brian Clark won the inaugural A. E. Van Vogt Award for his novel Alphanauts.